Designed to increase the functionality of your website, plugins can appear to offer a myriad of benefits. While the theory behind plugins is workable, the practical implications of using plugins can often be disastrous for businesses. Identified as a security threat, many companies have expressed concerns over the reliance of plugins from big name developers. With many development companies offering plugins as a way to enhance security and increase site features, it seems their users are unable to maintain a functional site without resorting to plugins. While plugins may have their advantages, the security risk associated with them cannot be underestimated. Millions of site owners have been brought to their knees because of the risks posed by plugins, and the threats keep on coming. Many Open Source web management platforms and systems offer plugins built by developers within the Open Source Community. Anyone, with sufficient technical knowledge, can create a website plugin. So, what is the main problem with plugins? Simply put: a lack of proper security testing prior to being released, leaving a backdoor open to exploitation. Often vulnerabilities are only discovered after a security breach, at which point it's too late. The new data protection laws have many business owners and agencies scrambling to implement new practices and protocols. As a results, some web developers are offering plugins designed to help site owners achieve GDPR compliance. Whether true GDPR compliance can be achieved with the sole use of plugins is, in itself, debatable. The far-reaching data protection laws can warrant significant organisational changes and many of these are likely to be beyond what a plugin can offer. Furthermore, reliance on plugins is merely increasing security vulnerabilities. Every time a plugin is used, it creates a crack in your web presence. This crack can be accessed by hackers, who can then gain access to your site, your data and your customer’s information. While this can be catastrophic for single businesses, it could be even worse for client-based companies. 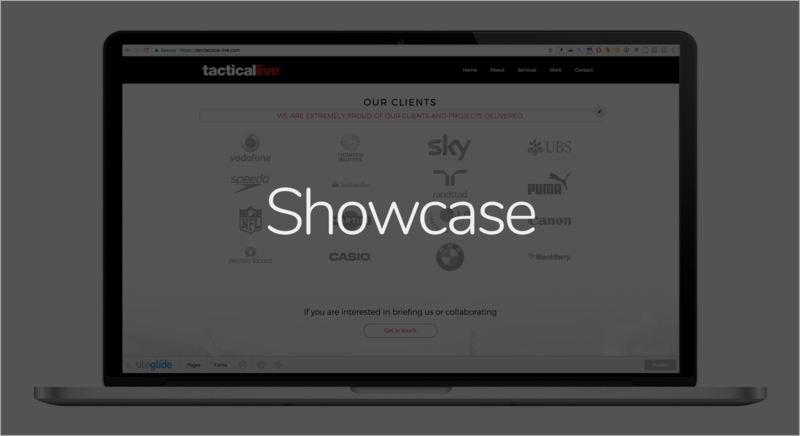 Agencies who manage and maintain websites on behalf of clients, for example, could inadvertently decrease their client’s web security by using a web development platform which relies on plugins. Despite the publicity surrounding the GDPR, many businesses and agencies have yet to take action. As a result, many will be clamouring to install plugins and updates in an attempt to adhere to the new laws and avoid subsequent penalties. Due to this, it may be a matter of time until the latest security frenzy. With hackers ready and waiting to pounce on unsuspecting website owners, will plugins once again be their way in? Security is, perhaps, the most important element of website management. If your site remains unsecured, your brand, finances and data are at risk. In fact, a serious security threat could be enough to sink your company, so it’s important to pre-empt the risk now. Maintaining your sites on reliable servers, without the need for plugins, increases your security and enables you to manage your online presence quickly and easily. Siteglide is a development platform which ensures you can do just that. Hosted on AWS, you’re guaranteed an up time of 99.99% and you won't need to worry about plugins threatening your security - because they're aren't any. If you’re working on behalf of other clients, Siteglide can make your job even easier. 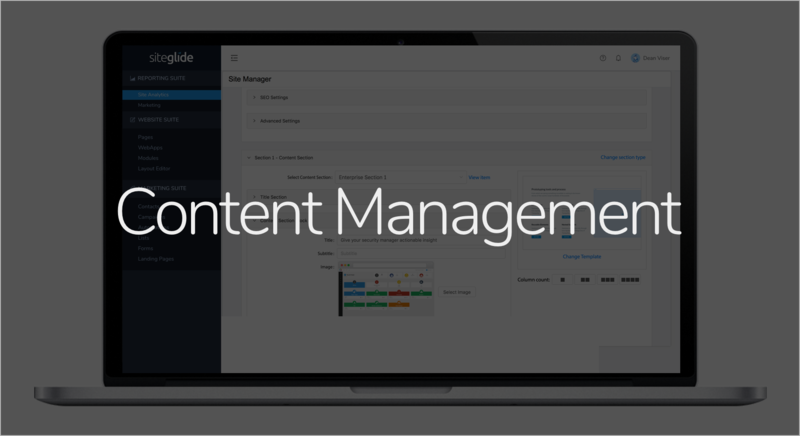 Simple and straightforward content management ensures you can update, modify and delete content in a matter of seconds, meaning you needn’t spend as long managing each site. Furthermore, you can rest assured your client’s web presence is safe and secure at all times, thanks to Siteglide’s commitment to reliability, security and support. Created with the GDPR in mind, now is a great time to make the switch and try a new and exciting development platform. 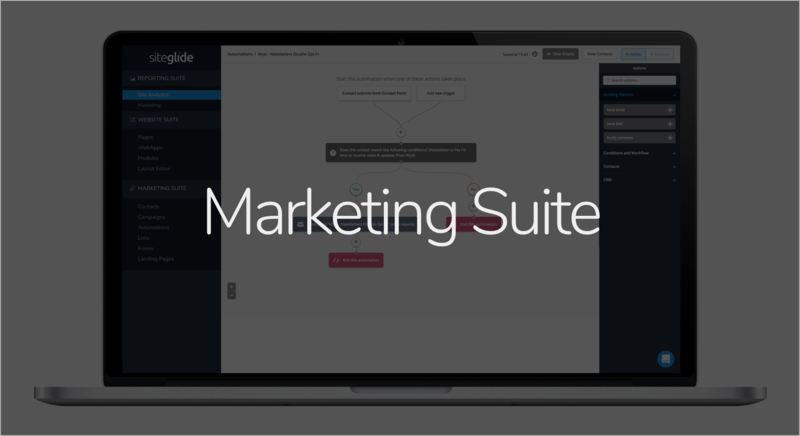 Designed to facilitate site maintenance, customer management and marketing automation, Siteglide will make your website management a breeze. To find out how Siteglide can work for you, get in touch with our team today.